While there can be no doubt that Q*bert is one of the great arcade classics and one of the most recognizable classic arcade characters, I always found it to be incredibly frustrating. Yes, it was a difficult game but it isn’t really the difficulty itself that really bothered me. It was the fact that I was always leaping to my death by accident because I never quite grasped the pseudo 3D viewpoint. 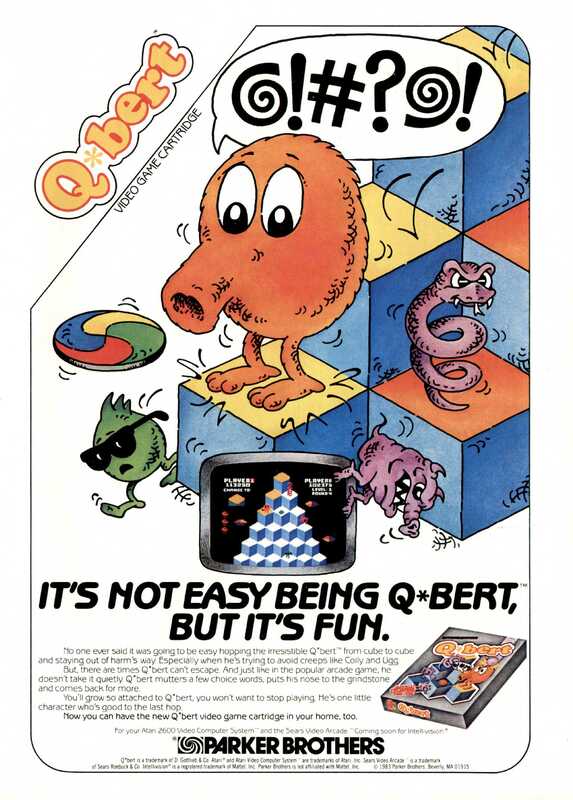 For those that don’t know, in Q*bert you controlled…well, Q*bert…in his effort to escape various creatures and obstacles by leaping around a pyramid. Game play was fairly simple. You just jumped from square to square up or down the pyramid. The goal was to hop on each square to change its color. Once all squares were changed, you proceeded to the next level. Of course you had to avoid getting trapped by the various on-screen enemies. However, for me the view point always caused me issues. It seemed like I was always leaping to my own death by accident. As the levels progressed, things got harder. You would have to jump on each square multiple times, enemies would move faster and there would be more of them, etc. Q*bert was first released to the arcades in 1982. Ports to various systems started appearing the following year. While this add is targeted towards the Atari 2600 version (and mentions the upcoming Intellivison version), there were a wide variety of systems this game was ultimately available for. Because of the limited nature of the Atari 2600, it really isn’t one of the better ports. The graphics were actually ok for that system but the pyramid was smaller and there were fewer enemies. The controls also suffered (and I already hated the controls anyway). If you are looking for an original copy of the Atari 2600 version then they are relatively common and can be had for a reasonable price. You can always use emulation too. However, if you really want to play Q*bert you are better off using MAME to emulate the arcade version or checking out the more recent release Q*bert Rebooted which was released for various modern systems in 2015 and includes a port of the original arcade game. The ad above is from the August/September 1983 issue of Video Games Player magazine. Screen shots are from the Atari 2600 version of the game. 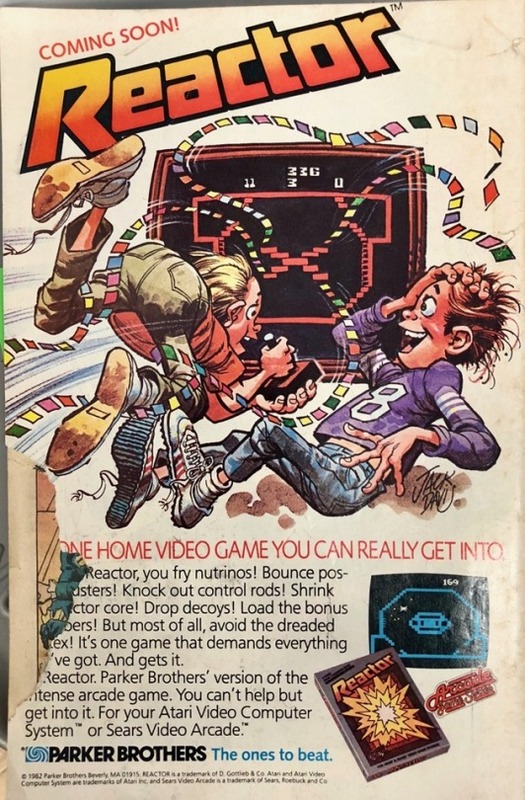 Reactor was originally an arcade game by Gottlieb in 1982. However, is was ported to the Atari 2600 and released on that platform by Parker Brothers the same year. The goal of the game is to prevent a nuclear reactor from melting down. The control scheme of Reactor is rather unique. In the center of the screen is the reactor and it is constantly pulling you towards it as if it were a black whole. There are various “enemy” radioactive particles that are trying to kill you. Touching the particles or the barrier around the reactor is a bad things. However, you can only speed up or slow down as you “orbit” the reactor in order to control your trajectory. You don’t control your movement directly. Particles are affected by the reactor’s pull as well but they try to steer towards you. You have traps that you can set that the particles will target instead. Setting them in the right place can lead to them colliding with the reactor and being destroyed or into the control rods and destroying them which is your ultimate goal. The relative uniqueness of this game makes it worth trying though it won’t be for everybody. The arcade version has the advantage of using a trackball whereas most Atari 2600 owners were stuck with a joystick. However, a trackball can be used on the Atari 2600 as well. The joystick is not a great substitute and I definitely recommend trying out a trackball even if you play this on an Atari 2600. I’m not aware of any re-releases of this game and while an Intellivision port was planned, it was never released. If you want to give this game a try then you will either have to resort to emulation (of the arcade game or the 2600 version), or hunt down an original. The Atari 2600 cartridges are not terribly hard to find. 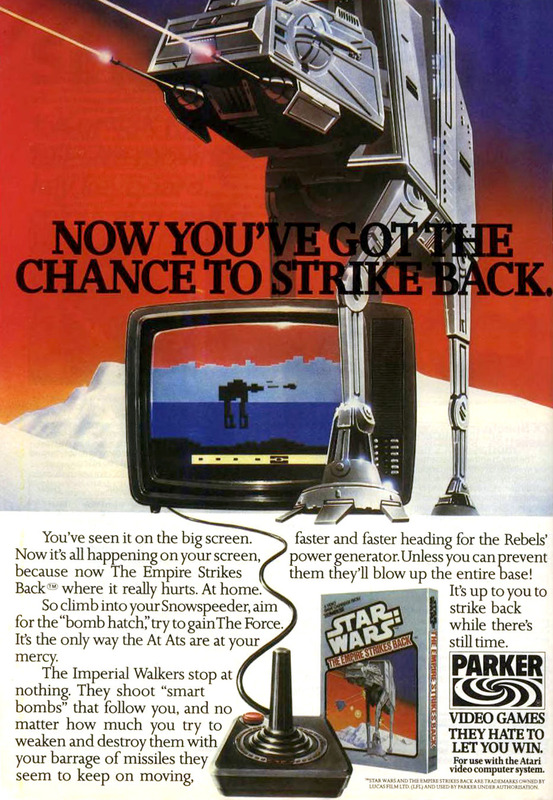 The Empire Strikes Back was released by Parker Brothers for the Atari 2600 in 1982. It shouldn’t be confused with the vector based arcade game that was released in 1985. They are completely different games. While the Atari 2600 version is somewhat derivative of Defender, it is a decent game and one of the better Star Wars games on the 2600. The basic game play is much like Defender in that you can fly horizontally in either direction and shoot things. The difference is that instead of shooting down flying saucers and rescuing humans, you are trying to destroy Imperial Walkers. As the game progresses, they move faster as they try to destroy your shield generator. Your goal is to stop them. It is a little more simplistic than Defender and as such doesn’t have quite the replay value. Empire Strikes back is a fun enough diversion in small doses but it can get repetitive (but that can be said of most 2600 games). For Star Wars and Atari 2600 fans I would say that it is definitely a game you want to have. Fortunately, it is easily emulated and original cartridges can be found reasonably priced, particularly if you aren’t concerned about a complete in box copy. I don’t believe this one has been re-released and as a Star Wars movie license probably won’t be. However, there is also an Intellivision version of this game if you prefer that system.